Join us for our annual fall celebration! Fall Fest is celebrated every third Saturday in October. 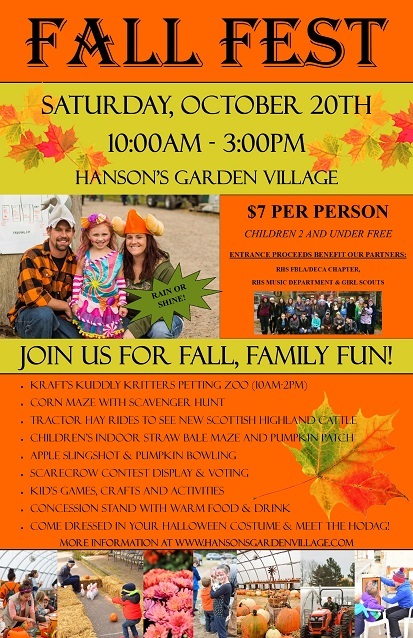 It is Hanson's Garden Village's last big event before we close down for the winter months. Fall Fest was created to give the local community an opportunity to do fun, fall activities as a family. Proceeds from Fall Fest benefit the many community and school groups that help run the event. Past groups that have helped with the event include: Rhinelander High School Music Department, Rhinelander High School FBLA/DECA Chapter, Oneida County 4-H, Girl Scouts and The Rhinelander Area Optimist Club. See photos from past Fall Fests here! We have fall activities going on all season at Hanson's! Starting around mid-September we open the doors to Hanson's Pumpkin Patch including the free children's straw bale maze and also our fun corn maze and scavenger hunt! We also offer tractor hay rides throughout the season.